In the summer of 1955, Traction Engine Rallies as we know them were few and far between, despite that fact that there were a growing number of people who were preserving the old steam giants of road and field. The well known ‘Wagers for Ale’ in the early fifties when Arthur Napper raced his friend Miles Chetwynd-Stapylton, and later Giles ‘Doc’ Romanes with their respective engines, started off this increased interest in machines that up until then had been worth only the value of the scrap metal they were made of. However, in the summer of ’55, a one day steam party took place at Cokerhurst Farm, Wembdon on the outskirts of Bridgwater, that would had far wider reaching results than its organisers could ever have expected. Somerset Traction Engine Club Life Member Jim Day, who has a wonderful memory for someone in his senior years remembers that the Programme was just one sheet of paper and unfortunately probably because of this not one seems to have survived. Perhaps all avenues of research have not been gone into and someone else remembers what did occur. 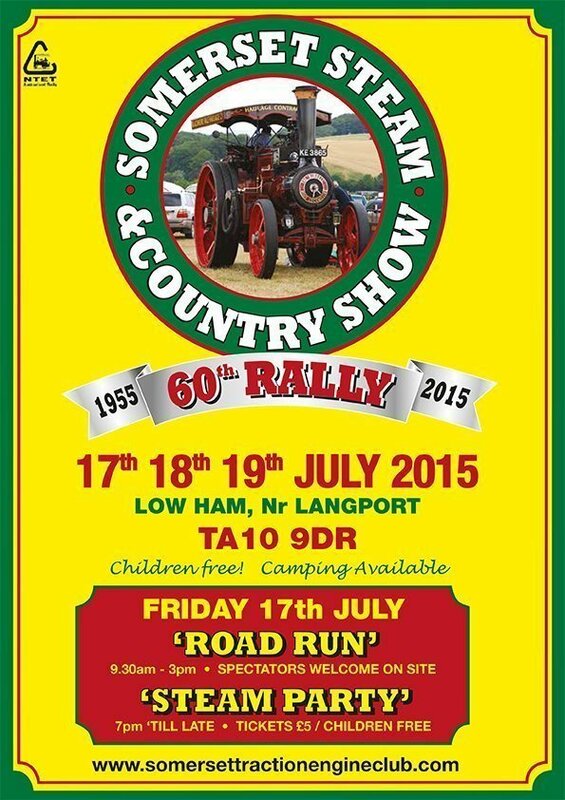 The rally hoped to raise funds for the NFU and the Police Benevolent Fund. Superintendent White was the officer in charge at Taunton and must have had an affection for steam engines. Reuben Smith remembers something of the first event. Geoffrey King who lived at Temple Cloud was the Chairman, and Reuben was the Secretary and virtually did everything towards sorting out the organisational side of things before the Rally took place. Nothing like it had been done before and it was a case of doing the best you could. Harold Strong, Dennis Chappell, Jack Handel and Cuthbert Sweet were part of the committee. Reuben remembers how for about three years at the Rally two policemen would accompany him to the Night Safe at the Bank to deposit the days takings. The ritual was for them to jump out of the car with their Truncheons drawn whilst the deed was done. All the engines were roaded to the rally, some travelling considerable distances to attend. Reuben himself helped Geoffrey King road the engines back to Temple Cloud, which was no mean feat especially with the hills of the Mendips to contend with. The following article appeared on Page 11 of the Bristol Evening World on November 14th 1955. Bristol in those days had two evening news papers, the Evening Post and the Evening World. An unusual hobby, which brings callers every weekend to a West Buckland Farmer, Mr Dennis Chappell of Longdale is collecting and preserving Traction Engines. 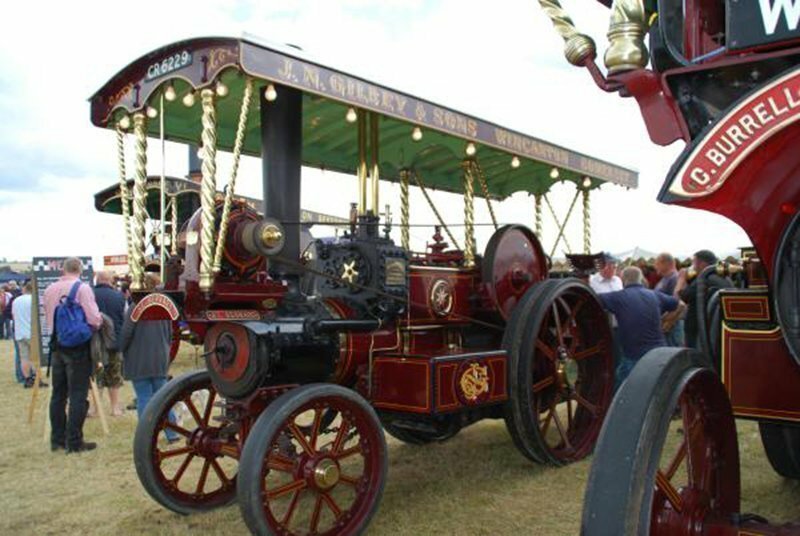 It may seem strange but this is a hobby, which is becoming more and more popular and competition for the ownership of Traction Engines has greatly increased. Mr Chappell who works Millers Farm near Wellington has two engines, one nearly 40 years old called “King of the Belgians” and “Princess Mary”. Mr Chappell hopes to have them ready for a rally to be held in the Bridgwater area in 6 months time. Mr G.B. 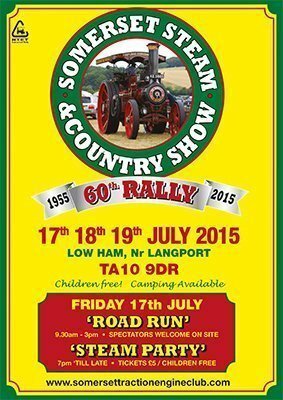 King of Temple Cloud, the well known Traction Engine Enthusiast is hoping to organise the Rally. Mr L Faun Managing Director of Messrs Henry Kellands of Cannington has promised to help with the arrangements. The second event was a one day Rally held at Walford Cross on Saturday the 28th July 1956 on ground owned by a Mr W E Godfrey, opened by the Mayor of Taunton it was called the Taunton Traction Engine and Veteran Car Rally. Admission was by way of programme and the cost was one shilling and sixpence. It had a beer tent (called a licensed Buffet in those days). Eleven engines were listed in the programme for the event, 6 Burrells, 2 Fodens, 1 each of Aveling and Porter, Fowler and Marshall. Nine cars, included one White steam car none of which were any newer than 1916 and an experimental Steam Motor Cycle. In an address on the back of the programme, Reuben J Smith the Hon Secretary welcomes people to the Rally organised by the National Farmers Union. Taunton steam traction engine and veteran car rally, at Walford Cross, on Saturday provided the biggest sporting attraction of the season. It was the first event of its kind in Somerset, and caught the public imagination beyond all expectation. The attendance exceeded 10,000. Thousands arrived late, including the Mayor of Taunton, Councillor R.F.Winckworth,who performed the opening ceremony, and the Mayoress, because of the chaotic traffic congestion. For most of the afternoon car queues stretched from Taunton to Bridgwater in both directions from the ground. There were 11 entries from all parts of the west for the traction engine competition, the majority of which were built before or during the First World War. They ranged from a comparatively modern Foden tractor, capable of 30 mph, to an 18 ton glittering fair engine which Burrells built more than half a century ago. Thousands lined the ringed arena to see these “gladiators of the road” chug proudly through their paces in a variety of events. They displayed adroit steering qualities and a fine turn of speed in the obstacle and musical chairs events. Leading the traction engine procession was the 1913 Burrell show engine, “Perseverance the Second” owned by Mr Leslie Casely, of Rigg Lane Farm, Trent, near Sherborne. His chief passenger was the Mayor, attired for the occasion in a boiler suit. “It was not too comfortable, as I had to rest on the coal stack,” said the Mayor, “but we travelled a jolly sight faster than I did driving from Taunton this afternoon.” “Perseverance the Second” won the silver challenge cup presented by the organisers, theTaunton Traction Engine and Veteran Car Committee, for the most elegant engine. Mr Casely, a farmer, has been interested in traction engines all his life. “They are my hobby, and I have two more besides this one”, he said. 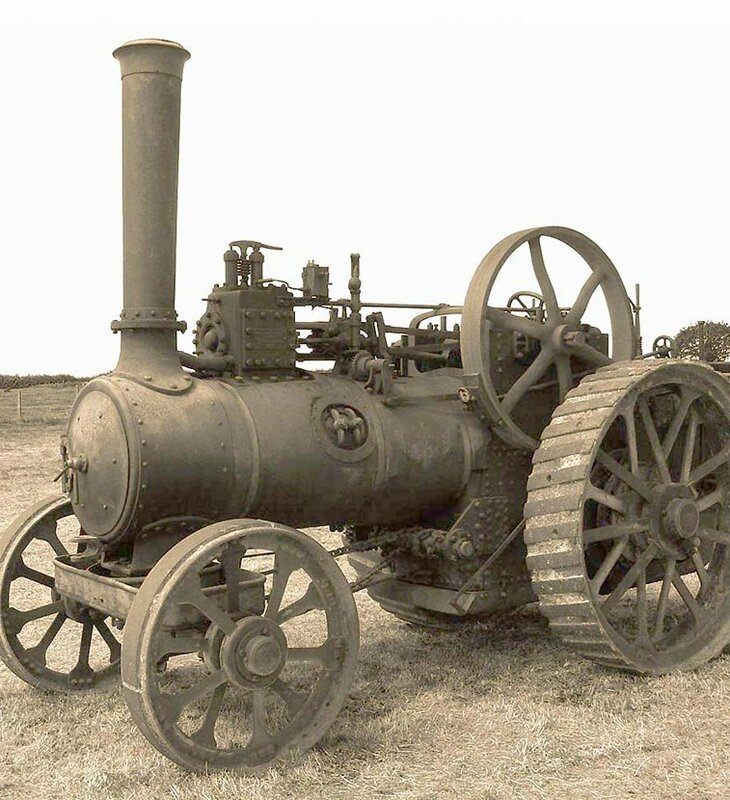 “One of them is still used on the farm.” Second prize went to Mr John Chappell, well known for his interest in antiques, with his 1905 Burrell engine, the oldest in the rally. Mr Chappell of Cokerhurst Farm, Wembdon, came across the engine at Langport, in a practically derelict state, put it into working order, and now uses it on the farm. Following these two early events, further rallies were held at Walford Cross, as well as at Nerrols Farm (now a housing development) and Farm on the outskirts of Taunton. 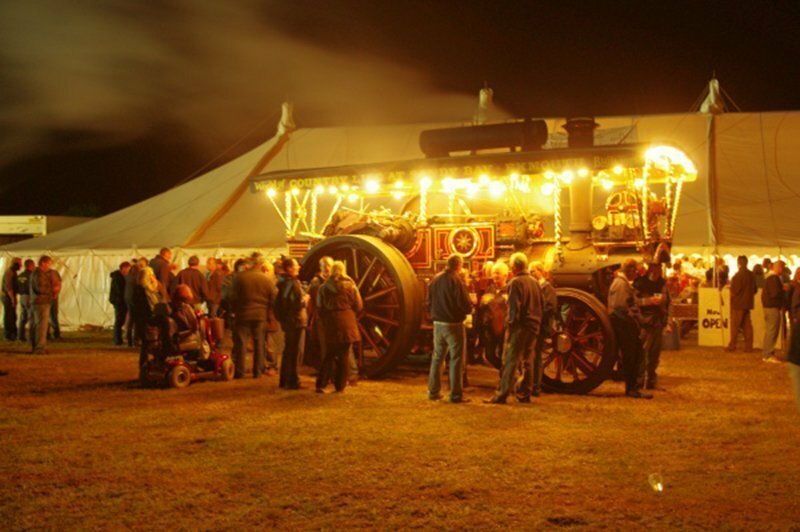 In 1959, the Taunton Traction Engine Rally Committee became The Somerset Traction Engine Club, and, for a few years in the sixties their event moved to Ash Cross at Thornfalcon. The next venue for a few years was the Yeovil Showground at Barwick Park. In 1978, by courtesy of the Cook family, the rally was located at Manor Farm, Low Ham, and this fine site with its picturesque surroundings has been our venue ever since. Over the years, the format of the event has changed out of all recognition when compared with the simple Saturday afternoon rallies of early days. The Club has gained a reputation for innovation, and the first major development came in 1989 when we established our long arena and continuous steam displays, even after dark on occasion. At the same time, for safety reasons we began to use the orange fencing that is now so widespread; we were the pioneers, and after a visit to our rally that year by ‘Mr Dorset’ himself, Michael Oliver, the Great Dorset also began to use the fencing – but after we had come up with the idea!! Notable occasions have been the visit of the late Fred Dibnah in 1989, and our highly successful Reunion of many of the surviving vehicles and steam engines of W J King, the Bishop’s Lydeard Contractors. We even had the ‘stars’ of TV’s ‘Robot Wars’ with us – the first time for any rally, as well as those of ‘Salvage Squad’ both the engines and the people. So the Club and its rallies continue to thrive. The Club celebrated its own Fiftieth Anniversary in 2009. If you have any reminiscences or photographs of past events, let us know.